Laparoscopic splenectomy is gaining popularity due to less morbidity and minimal operative complications. Nowadays, laparoscopic splenectomy is the approach of choice for both benign and malignant diseases of the spleen. Splenic pseudocyst due to non-traumatic cause has been very rarely reported in literature. 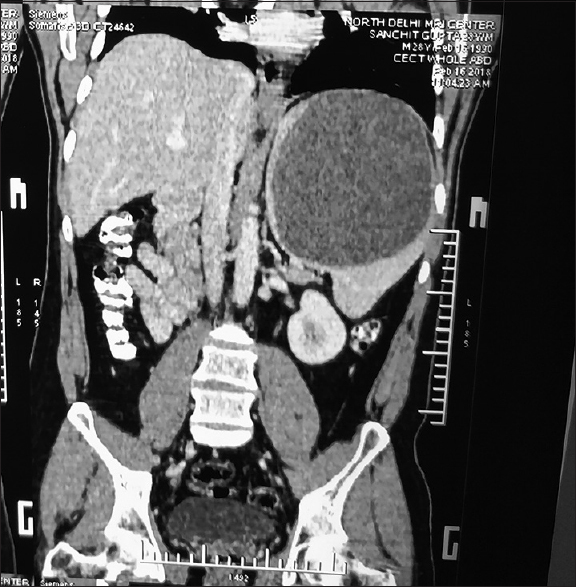 We report an interesting case of a rare large splenic pseudocyst without a history of previous abdominal trauma, treated successfully by laparoscopic technique and discuss literature for the same. Splenic cysts are rare benign tumours with an incidence of 0.07% in general population. They can either be parasitic (hydatid), caused by the parasite Echinococcus granulosus, or non-parasitic. Non-parasitic cysts are classified as primary (25%) and secondary (75%) according to the presence or absence of an epithelial cellular lining the inner wall. Among the non-parasitic cysts, one rare kind is a splenic pseudocyst (SP). Most of the cysts (60%) are asymptomatic and diagnosed incidentally by ultrasonography or computed tomography (CT) scan. The SPs are a type of cysts, which cannot be clinically distinguished from other types. The rarity of this case lies in the fact that it is often misdiagnosed and wrongly treated and eventually requires surgical exploration. Laparoscopy has gained increasing acceptance as a standard approach in elective splenic surgery., We report an interesting case of a rare large SP without a history of previous abdominal trauma, treated successfully by laparoscopic technique and discuss literature for the same. A 27-year-old male patient without significant past medical or surgical history presented to the outpatient clinic department with incidental finding of splenic cyst on ultrasonography which he had undergone few days back for vague pain abdomen. He could not recall any abdominal trauma in the past. Physical examination was unremarkable except for a non-tender splenomegaly up to 3 cm from the left subcoastal margin. A CT scan [Figure 1] was done which showed splenomegaly with non-enhancing cystic lesion of size 14 cm × 11 cm. Haematological including ELISA for hydatid serology and biochemical tests was normal. Laparoscopic splenectomy was planned for the patient because of the large size and possibility of pressure symptoms. He was given a course of antihelminthics and vaccinated against Streptococcus pneumoniae, Haemophilus influenzae and Neisseria More Details meningitidis was given 2 weeks before surgery. On the operating table, the patient was placed in the right lateral decubitus position, left side up at a 45°–60° angle in reverse Trendelenburg position with the left arm positioned as for a left lateral thoracotomy. Operating table was flexed 30° at the flank to increase the distance between the lower rib and the iliac crest. 5 ports were used, with one 10 mm camera port at supra-umbilical area and rest being 5 mm ports. Intraoperatively, the cyst was causing pressure atrophy of the residual splenic parenchyma and also had multiple perisplenic and pericystic adhesions. The cyst fluid was aspirated which was clear in colour and around 1.5 L in volume. Dissection was started from inferior pole and Splenocolic along with lienorenal was divided. Further medial mobilisation was done by dissecting the gastrosplenic ligament. Splenic vein and artery were ligated at hilum as shown in [Figure 2]. Finally, splenophrenic ligament was divided which lead to completely mobilised spleen. Spleen along with cyst was removed in to in endobag by dilating 10 mm right hand working port. Drain was inserted in the operative area. Fluid aspirated was sent for cytological examination and specimen extracted [Figure 2] was sent for histopathological examination. Cytology smears showed predominantly degenerated neutrophilic infiltrate with no parasites. Histopathology of the specimen showed fibro-collagenous tissue lining the cyst wall with no definite cyst wall lining with no evidence of cellular atypia suggesting pseudocyst of spleen. Postoperatively, the patient was started on a liquid diet on the same day and semisolid diet on next day. Patient's recovery was uneventful and was discharged on the 2nd post-operative day. The patient has been asymptomatic for 6 months and engaged in his routine activities. Splenic cysts have been a matter of curiosity, with a reported incidence of 0.07% in general population. Since their recognition in 1829 by Andral and first splenectomy in 1867 by Pean for this condition, there have been infrequent reports in the literature. They can either be parasitic (hydatid), caused by the parasite E. granulosus, or non-parasitic. Non-parasitic cysts are classified as primary (25%) and secondary (75%) according to the presence or absence of an epithelial cellular lining the inner wall. Of all non-parasitic cysts, SPs constitute 70%–80%. The incidence can be expected to rise further with non-operative management of blunt abdominal trauma becoming more popular. The reports of SP due to non-traumatic cause have been very rarely reported in literature. Suggested alternate etiologies include infections and degenerative diseases. Confirmed diagnosis of SP can only be done by histopathological examination. Total splenectomy has been the most common treatment option for SP larger than 5 cm. Laparoscopic unroofing and drainage or marsupialisation or decapsulation has been reported in literature but have a high recurrence rate of up to 20%–40%. Splenic cysts are rare benign tumours with pseudocyst of spleen being a further uncommon pathology. SP will need treatment if symptomatic or size >5 cm. Total splenectomy is the most common treatment being performed for operative cases, as once treated adequately, SP has a good outcome. Awareness of its clinical presentation and good pathological expertise are important adjuncts in the diagnosis. Laparoscopic splenectomy has been gaining popularity and is a feasible option for such patients with less morbidity. Williams RJ, Glazer G. Splenic cysts: Changes in diagnosis, treatment and aetiological concepts. Ann R Coll Surg Engl 1993;75:87-9. Galyfos G, Touloumis Z, Palogos K, Stergios K, Chalasti M, Kavouras N, et al. Oversized pseudocysts of the spleen: Report of two cases: Optimal management of oversized pseudocysts of the spleen. Int J Surg Case Rep 2014;5:104-7. Kostka R, Vernerov´a Z. Post-traumatic pseudocyst of the spleen. Rozhl Chir 2010;89:464-8. Fernández-López AJ, Candel-Arenas M, González-Valverde FM, Luján-Martínez D, Medina-Manuel E, Albarracín Marín-Blázquez A, et al. Laparoscopic cleavage in splenic symptomatic cyst. Cir Cir 2017;85 Suppl 1:26-9. Shrestha AL, Shrestha P. A rare encounter with an expanding pseudocyst of the spleen. Case Rep Gastrointest Med 2017;2017:9896856. Chin EH, Shapiro R, Hazzan D, Katz LB, Salky B. A ten-year experience with laparoscopic treatment of splenic cysts. JSLS 2007;11:20-3. Bai YN, Jiang H, Prasoon P. A meta-analysis of perioperative outcomes of laparoscopic splenectomy for hematological disorders. World J Surg 2012;36:2349-58. Misiakos EP, Bagias G, Liakakos T, Machairas A. Laparoscopic splenectomy: Current concepts. World J Gastrointest Endosc 2017;9:428-37.